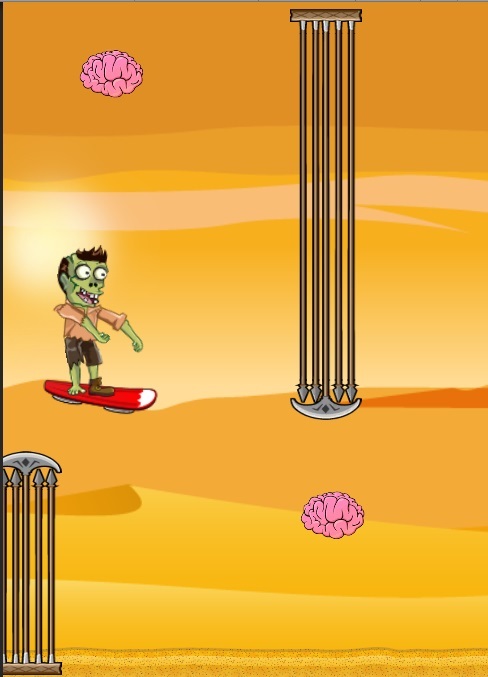 After a big re-factor and upgrade to Unity 5, I’m pleased to report that my biggest hurdle to my zombie game is making it fun. 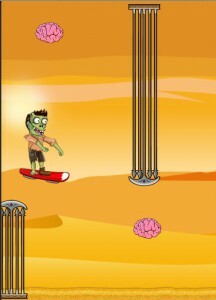 Currently I have the movement using a three lane system, with keyboard, mouse or taps moving the zombie into the appropriate lane. The problem with this is that this limits the way the obstacles can come at the player. There must be a hole in one of the three lanes for each set of obstacles. Unfortunately I’m realizing that there’s only one pattern of obstacle that provides any kind of a challenge, and that is a long top or bottom obstacle followed by the opposite long obstacle on the other side. This unfortunately makes the game fairly boring pretty fast. Having a more horizontal view might help with this, but for now I am going back to the drawing board on player input and obstacles. I could always just insert some flappy bird style tapping, but that’s been way overdone. Still it might work for this game. Another thought I have is that a tap moves the player in one direction, and another tap moves back in the opposite direction. To stay in one place would require rapid tapping. I will be trying both of these input methods and tweaking the obstacle generation to see if it makes the game more fun. Stay tuned! *EDIT* I ended up scrapping this game. Through health challenges and realizing it just wasn’t fun and interesting enough, this project is indefinitely on hold. Sometimes it pays to know when to stop a project early on.